2. Mix olive oil, garlic, lemon juice. Coat salmon liberally on both sides with oil mixture. 3. Mix Black Lava Sea Salt, oregano, garlic powder, black pepper. 4. Make an aluminum boat large enough to hold salmon. 5. Sprinkle non-skin side of salmon with sea salt mixture and oregano, place salmon in boat, skin side up. 6. Allow skin side to crisp, about 3-4 minutes. 7. 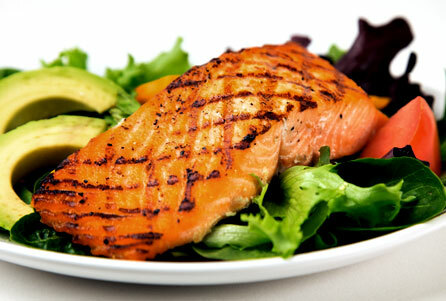 Turn salmon then close grill and cook for another 5 to 8 minutes. 9. Remove from grill, serve over salad or over rice.